Be the first to share your favorite memory, photo or story of Billie. This memorial page is dedicated for family, friends and future generations to celebrate the life of their loved one. 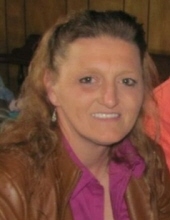 Mrs. Billie Jean Moore Hart, age 48, of Greensburg, passed away on Friday at her home in Greensburg. Two sons & a daughter-in-law: Jeffery Wayne Perkins, Joshua Earl & Hannah Perkins, all of Greensburg. Two brothers and four sisters: David Moore of Corbin, Roger Moore of Michigan, Kim Sturgeon of Cave City, Lisa Elmore of Hodgenville, June Clem of Harlan, and Susan Maggard of Harlan. The funeral services for Mrs. Billie Jean Moore Hart will be conducted at 1:00 PM, Tuesday at the Cowherd & Parrott Funeral Home, burial in the Macedonia Cemetery. Visitation will be from 2:00 PM until 8:00 PM Monday at the Cowherd and Parrott Funeral Home and after 7:00 AM Tuesday until time of the service. Memorial Contributions are suggested to the Gideon Bible Fund and can be made at the Cowherd & Parrott Funeral Home. **A FULL & COMPLETE OBITUARY WILL BE ADDED LATER. THANK YOU. To plant a tree in memory of Billie Jean Moore Hart, please visit our Tribute Store. "Email Address" would like to share the life celebration of Billie Jean Moore Hart. Click on the "link" to go to share a favorite memory or leave a condolence message for the family.